The Seventeenth Judicial District Commission on Judicial Performance recommends, by a vote of 5-3, that Judge Dianna L. Roybal BE RETAINED. 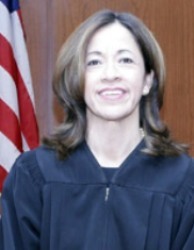 Judge Roybal, an Adams County Court Judge in the Seventeenth Judicial District, was appointed to the County Court bench in 2003. Prior to her appointment, she was in private practice, served as a Deputy District Attorney for the Adams County District Attorney’s Office and as a Magistrate for the Seventeenth Judicial District. Judge Roybal graduated in 1981 from Colorado State University with a Bachelor of Science degree in Psychology, and obtained her Juris Doctor in 1995 from the University of Colorado. Judge Roybal’s case load currently consists of 30% criminal, 30% misdemeanor and 40% traffic infractions. In arriving at their recommendation, Commission members interviewed Judge Roybal after reviewing survey results provided by lawyers, and others who have appeared in front of Judge Roybal or otherwise observed her in court. The Commission also reviewed Judge Roybal’s self-evaluation, observed her in court, and reviewed a number of decisions rendered by the Judge. During this election cycle, Judge Roybal's survey results from attorneys and non-attorneys revealed ratings that were below the statewide average among all county judges standing for retention. Of attorneys responding to the survey, 44% recommended to retain, 40% not to retain, and 16% made no recommendation regarding retention. Of non-attorneys responding to the survey, 88% recommended to retain, 8% not to retain, and 6% made no recommendation regarding retention. (These percentages may not total 100% due to rounding). Commission members were seriously concerned by the below-average survey grades provided by attorneys who appeared before the Judge, particularly with regard to questions concerning the judge’s knowledge and application of the law. The Commission concluded, however, that these survey results are not corroborated by any noteworthy history of appellate reversals. Rather, Judge Roybal had only one appellate reversal during the last four years, despite having the highest proportional number of appeals (as a percentage of her caseload). Judge Roybal has demonstrated a willingness to improve her knowledge of the law by attending extensive continuing legal education programs well beyond the minimum required for judges, and she indicated that she intends to continue these efforts going forward. The Commission also recognized the relatively high volume of jury trials and hearings Judge Roybal has managed in comparison to her peers. Based on its review, the Commission recommends, by a vote of 5-3, that Judge Dianna L. Roybal BE RETAINED.